"With Cameo sold to upgrade their family horse truck, 11-year-old Kelly has to find a new pony for just a fraction of the cost. Her troubled search ends when she meets Koolio. She is convinced the gorgeous grey is a champion in the making But Koolio also comes with some big probl... read full description below. 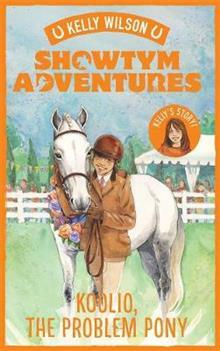 In the fifth Showtym Adventure, Kelly's new pony is gorgeous, talented and a whole world of trouble. Will he overcome his problems to reach his potential?With Cameo sold to upgrade their family horse truck, 11-year-old Kelly has to find a new pony for just a fraction of the cost. Her troubled search ends when she meets Koolio. She is convinced the gorgeous grey is a champion in the making But Koolio also comes with some big problems. Within weeks poor Kelly battered and bruised and ready to give up on him. That is, until her big sister Vicki comes up with a plan that could change everything. Will Koolio get past his bad behaviour to become the winner Kelly and her sisters believe he can be?This story of generosity and confidence restored is inspired by the Wilson Sisters? early years.